AN EXCELLENT start and an equally impressive last ten minutes were crucial to St Columb’s Derry coming through this thoroughly enjoyable Danske Bank Markey Cup semi-final in Strabane yesterday afternoon. Both teams made a mockery of the strong cross-field wind and served up a super game of football with plenty of scores, some fine passages of play and a gripping finale that sets the Derry city side up for a third successive game against Donegal opposition. St Columb’s started very well; they already had a Fergal Mortimer free registered before Eoghan Cassidy turned over a ball in midfield and ran right through for a fourth minute goal. St Columb’s added points from Cormac Mooney, Shane McElhinney and Cahir McMonagle before Coláiste na Carraige got themselves off the mark with a goal in the 9th minute; Dylan Ó Gara’s shot from distance was spilled in the Derry defence and Pauric Love pulled on the loose ball. Although St Columb’s cancelled that score with the next three points, the south-west Donegal school were back in the game and three points from Ronan Gillespie pulled the gap back to 1-9 to 1-4 at the break. And Carrick got the perfect start to the second half; from the throw-in a series of handpasses eventually put Ryan McShane in on goal and he made no mistake. Fergal Mortimer however steadied St Columb’s with a free before Ronan Gillespie swopped points with Mortimer around the 40th minute. For the next ten minutes it was all Carrick and they looked to be setting themselves up for a victory that hardly looked possible after the first quarter. Eric Mac Giolla Chearra got the ball rolling by pointing a 45 in the 41st minute and a couple of minutes later Pól Ó hEithir looked out of options in the corner, but he threaded the perfect pass for Eoin Mac Cormaic to take at pace and bury in the net. Coláiste na Carraige had taken the lead for the first time and brilliant midfielder Gillespie added a point. However the St Columb’s defence rose to the challenge and held the Donegal boys scoreless for the last 12 or 13 minutes and that allowed their attack to pick off the scores for victory. Mortimer pointed a free and then Shea Brown hit two in a row to edge his side ahead again. James Lynch and Conor McLaughlin rounded off the victory with late points, although Naoise Ó Mianáin’s injury-time interception prevented an almost certain goal that would have taken the teams to a replay. 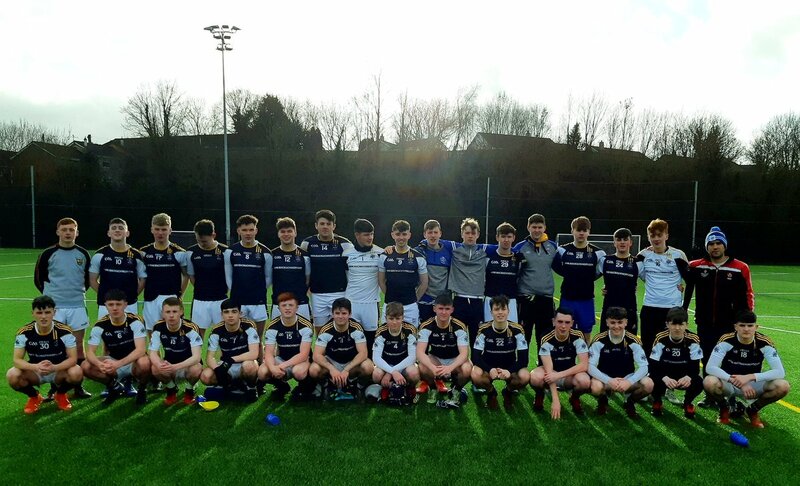 Having disposed of Milford CC in the quarter-final and now Coláiste na Carraige in the semis, there is yet another Donegal challenge ahead of St Columb’s – Abbey Vocational in next week’s final. The Danske Bank O’Doherty Cup game between St Aidan’s Cootehill and Coláiste Ailigh Letterkenny scheduled for Garvaghey yesterday was postponed because of the high winds and will now take place at the same venue on Monday evening with a 5.30pm throw-in. St Columb’s, Derry: M Stephenson; P Nelis, C McLaughlin (0-1), M Lynch; T O’Kane (0-2), S McElhinney (0-1), E Cassidy (1-1); C Mooney (0-1), J McAleer; S Brown (0-2), J Lynch (0-1), R Brown, C McMonagle (0-1), C O’Connor, F Mortimer (0-6, 0-4 frees).